The weather has warmed up (for the most part) and the World Cup in Brazil has kicked off. Which means it must be time for Negroni and Caipirinha. And while there really isn't much cause to modify the true classics, it is fun to tinker. 1) Add ingredients into a mixing glass. 2) Add ice and stir until well chilled. 3) String into an Old Fashioned glass with two large ice cubes in it. 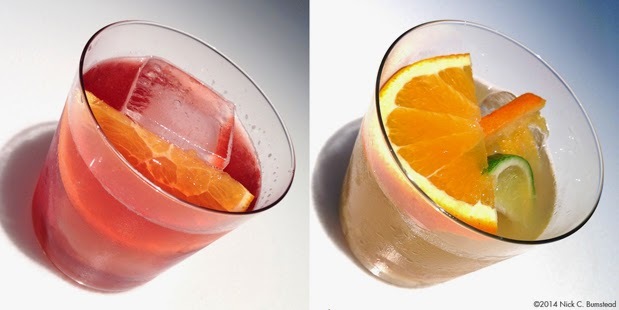 4) Garnish with a orange slice. 1) Trim the end of the lime, cut lime into wedges lengthwise and trim the pith from the center. 2) Cut the orange into a few slices. 2) Add citrus to glass and add sugar. 3) Muddle to extract the juice for about 15 seconds. 4) Add cachaça to glass and stir for about 15 more seconds. 5) Garnish with orange slice. Read more about cachaça and the caipirinha with Steve Luttmann from Leblon and Pete Nevenglosky of Avuá.